It's Babywise Friendly Blog Network week and my friends and I are blogging about frequently asked about topics. Today, I am talking about the topic I get asked the most about: scheduling. I love a good schedule. I have always loved a good schedule. I also married someone who appreciates a good schedule. So it should come as no surprise that when Kyle and I became parents, we like to set up and follow a good schedule. It is the second reason that drew us to Babywise in the first place. (The first reason was having so many friends in life stages ahead of us with well-rounded kids who loved to sleep, all of whom had used Babywise). 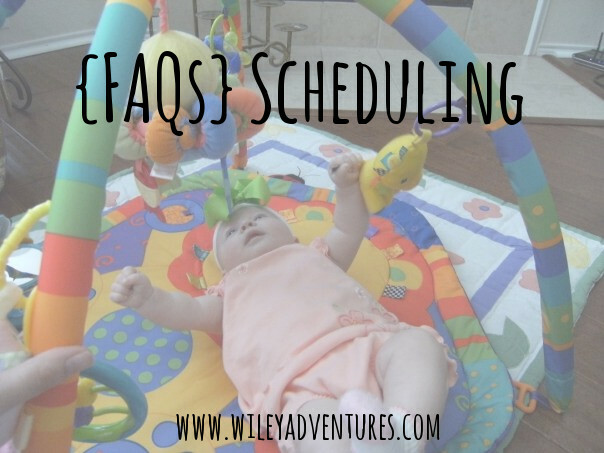 Now that we have done this a few times, I get asked a lot of questions about setting and keeping a schedule. Here are some things to consider. Whether you are starting from a pregnancy planning your first baby or even planning a schedule for your older child, my first suggestion is applicable: Write it down. Sit down with pen and paper, or at your computer and open up a fresh Word document and literally write down your ideal schedule. I think this is important because it creates a starting point and an "ideal". It's something to fall back on. Every day will not be perfect. But it sets your goal out before and gives you something to work towards. To figure out your ideal schedule, you need to gather the facts and needs of your child depending on their age. The age of your child determines how many feedings, how much awake time, and how many nap times are needed at that stage of life. Weeks 9-15: Starts with an average of 3 hour schedule and by the end most babies are in a combination of a 3-4 hour schedule. Most mothers transition to 5-7 feedings in a 24 hour period at this time. Weeks 24-52: During this phase, most babies transition to 3 meals a day, with a 4th feeding/nursing time before bed. These are all guidelines that Babywise suggests to help you plan your schedule. It always helps me to know the suggestions and then adjust to my child's personal needs and preferences as needed. It is also important when considering the number of feedings for your child to discuss it with your child's pediatrician. Multiple children. When setting a schedule for multiple children, you start at the same place... writing it down. Gather your facts and prioritize. I like to think of like a game of Tetris. Figuring out how to make your children's schedule work for the overall family. Remember, the concept of Babywise is that the family does not revolve around one member of the family, but that all are important members. Think about and prioritize the needs and adjust as needed. The main point of a schedule is that it should work for you and make your life easier. The moment it starts to make your life more difficult or you work for it more than it works for you, you need to adjust some things. The idea of a Babywise schedule, sometimes called a Parent Directed Feeding plan (PDF) is that you are creating a schedule and routine that meets your babies needs and benefits your family as a whole. Being consistent is very important, especially in the beginning weeks of a new schedule or routine. I have seen with my very own eyes the truth of you get out what you put into to it. It might take work and sacrifice, but the payoff and benefits make it worth it. The beauty of having a schedule or routine is that you can come back to it if you need to deviate from the schedule. The best example I have of this is church every Sunday. Some days, Archer will nap in the nursery right now during his morning nap time, but often times he ends up skipping his morning nap. So we have a little bit of a different schedule on Sundays. We adjust and yes he might be more fussy. The idea is that I am the parent and understand his needs as well as the priorities of our family, and I can determine his best schedule in that framework. Another example of the importance of a flexible schedule is on vacation. I try to keep nap times as close as I can on vacations, but sometimes it deviates or things don't go as planned. Having a normal and ideal schedule in place gives me something to go back to and helps me understand my child's needs if he is fussy. Because we are raising up actual human beings and not robots, we have to make adjustments and changes to our schedules from time to time. Whether it is dropping a feeding or adjusting to a time change, things are constantly growing and changing and we have to adjust as we go along. The best way I do this is to go back to the drawing board, so to speak. 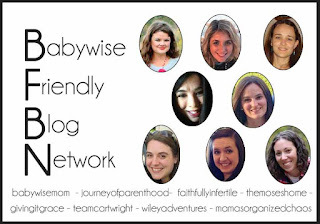 I gather my facts either through the Babywise book or in one of the BFBN blogs or ask questions on the Babywise Forums on Facebook (my favorite two: I Love Babywise! and Babywise Mamas. Both require admin approval to join.) Sometimes I even text my "mentor" Babywise moms and brainstorm or troubleshoot advice. As my babies have grown, I've had to learn and grow alongside them. Once I have my facts and my ideals in mind, I physically make the changes by writing down a new schedule. There have been a few instances that have arisen that it has been more beneficial to follow a routine rather than a "by-the-clock" schedule. The two biggest reasons for my kids have been reflux and the 45 minute intruder. All three of my boys had reflux to the point of it affecting my schedule. Each one required I handle it differently but the one thing that stayed the same for all three was relaxing on the clock and sticking with the Eat-Wake-Sleep routine. Shepherd needed to eat more frequently with his reflux, Fischer didn't need a different time, and Archer needed to eat less frequently. As for the dreaded 45 minute intruder, both Shepherd and Archer battled it. Shepherd, thankfully only lasted a couple weeks and the swing pretty much fixed it for him. Archer's lasted a long time....months even. Because it lasted so long we continually had to adjust his schedule. You can read about how we finally conquered the intruder here. The important thing to keep in mind is the Eat-Wake-Sleep routine and your families priorities. Don't be too stuck to a schedule that you end up missing the benefits of the routine. Keep in mind that you are the one directing the schedule.